With the increasing appetite and value offered by imported production yachts, it is perhaps surprising that America’s largest and most popular brand – Catalina Yachts – has failed to capture the imagination of Kiwi sailors. While this does not reflect any dislike or mistrust in the Catalina product, it does reflect what the New Zealand importer, International Marine, says is the cost of landing US-built yachts in New Zealand. 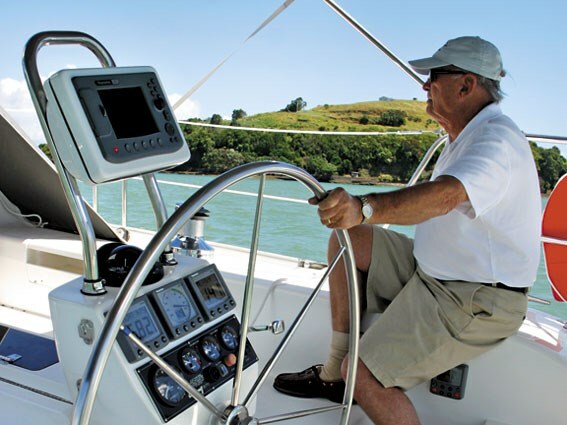 It is considerably cheaper, says International Marine's Norman Gee, to land a yacht from Europe and this is reflected in the disproportionate number of European-built yachts sailing in New Zealand. While Catalina Yachts is something of a sleeping giant here, the brand has a loyal following in America where it outsells all other production brands by more than two to one. Founded in 1969 by Frank Butler, Catalina Yachts has built an empire on the premise that change for change's sake is something to be avoided. This is reflected in what could only be described as a conservative approach to yacht design. While large European production builders commission many of their leading designs from names like Farr, Freers, Judel/Vrolijk and Humphreys, to name but a few, Catalina's Frank Butler has adopted a unilateral stance, relying on his own design skills to shape the majority of Catalina's cruising yacht range. This has achieved several things, according to Catalina. It has ensured that its yachts are structurally proven and have reliable systems while building a sense of camaraderie among owners. It also maintains excellent resale value across the Catalina fleet. "Our philosophy is straightforward," says Butler. "We design boats that stand up to real world conditions; that sail well, are comfortable above and below, are easy to maintain and hold their value. "And unlike many builders, we design each model for long production runs, often lasting decades. We don't discontinue models after only a few years, creating 'orphans' and negatively affecting resale value." While that stance has obviously worked for Catalina in the US domestic market, one suspects that international demand for higher levels of design sophistication might limit Catalina's role on the world stage. This corporate approach has resulted in a distinctive Catalina style and look that carries across the model range and is typified in the Catalina 42 Mk II which was, until recently, the flagship of the cruising yacht range. Remarkably, the Catalina 42 was launched in January 1989 and immediately set US production records with 100 yachts built in the first year. The model has subsequently sold more than 500, making it America's most popular cruising yacht in the 40 to 42ft range. And like many Catalina models, the Catalina 42 has had various internal upgrades and transformations over the years while the hull and deck configuration has remained unchanged. While you would be hard-pressed to describe the Catalina 42 as beautiful, it does have a certain handsome quality that is more likely to be recognised by sailors looking for a yacht with offshore potential. Furthermore, it looks like a yacht put together for its sailing ability rather than its capacity to host a small convention in a comfortable and curvaceous albeit marginal floating platform. And what it lacks in looks is more than compensated for in its practical durability, which has been proven across many ocean miles. With a moderately raked stem and stern, full U-shaped hull, extended low coach roof and relatively high topsides, there is nothing extreme about the Catalina 42. A generous rake to the bow gives her a short waterline, but in other respects the hull shape is typical for a moderate displacement yacht. There is plenty of volume for accommodation with a deep body and generous beam but the waterline plane is well balanced and the run aft clean. She has a deep forefoot, which contributes to a gentle motion and improved directional stability. The rig is a typical stout, deck-stepped, twin-spreader masthead design intended for offshore strength rather than round-the-cans tweaking. The Catalina 42 has a conventional, hand-laid GRP hull with vinylester resins for the gelcoat and skin coat to reduce water absorption and the risk of osmosis. The structural laminates are hand-laid using woven and non-woven rovings. A GRP floor moulding reinforces the hull and forms take-off points for the joinery. A deckhead moulding performs the same function for the deck. The deck is balsa-core sandwich with plywood backing pads glassed in to provide additional strength for lighter deck fittings. Major load-bearing areas, including the mast step, chainplates and stanchion bases, are solid fiberglass. Heavy deck hardware is mounted on raised pads with metal plates to accept hardware fastenings. The hull and deck has a shoe-box overlap, which is bonded and mechanically fastened and carries a five-year factory warranty against blistering and construction defects. The company casts its own lead keels, which are attached to the hull with 316 alloy stainless bolts cast into the keel for additional strength. The yacht complies with American Bureau of Shipping (ABS) standards. Pushpit seats (in the aft rail of the cockpit) make a comfortable place to sit and enjoy a drink and a commanding view. The helmsman's seat is comfortable and affords plenty of room to move behind the wheel with good access to the instrument panel and engine controls. You won't find any teak on the deck – in-line with Catalina's philosophy of keeping maintenance (and price) to a minimum. The cockpit is functional and well-sized for an offshore cruising yacht in this range. It features high, contoured coamings that provide comfortable seating and backrests and lend a sense of enclosure which will not go unnoticed at sea. A large fibreglass cockpit table with twin drop-leaves is mounted forward of the central pedestal and effectively divides the cockpit into two, but this is easily negotiated and provides genuine al fresco options. The aft seating can be opened to provide a walk-through stern with transom boarding platform, hot and cold shower, swim ladder and storage lockers. There is a large double stainless steel anchor roller and locker at the bow, fitted with a Maxwell 1500 electric anchor windlass with up and down foot switches as standard. The shroud base is moderate and well inboard providing wide decks with inboard and outboard sheeting options. Quality deck gear and equipment is specified as standard throughout, including deck hardware. The headsail sheets lead back to two-speed, self-tailing Lewmar 54 primary winches – within reach of the helmsman – while the halyards, sail controls and mainsheet system are all controlled via two self-tailing Lewmar 40s mounted at the aft end of the coach house. The review boat was fitted with optional Forespar in-boom furling via an electric Lewmar 46 power-winch. 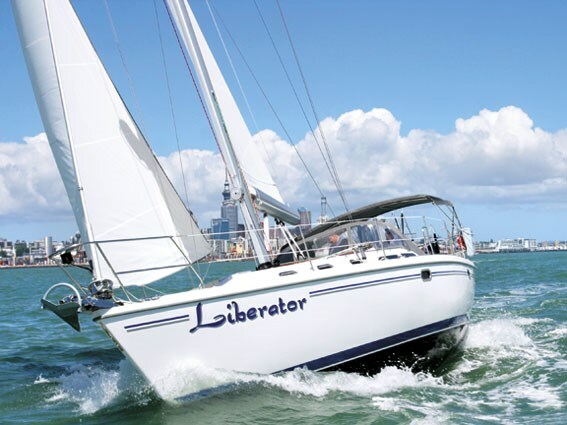 With a quality Schaefer 3100 headsail furler, Garhauer mainsheet traveler, roller-bearing blocks and clutches, the Catalina 42 Mk II has been set up with reliable and proven systems for stress-free and controlled sailing. Perhaps the only negative in terms of the yacht's short-handed ability is the location of the mainsheet on the coach roof. This is beyond the reach of the helm and, unless modified, cannot be eased without leaving the helm. Cockpit storage is reasonable with twin gas lockers, twin (smallish) utility lockers built into the stern moulding and two very deep aft lockers in the rear of the cockpit. These should ideally be fitted with shelves because, as supplied, it is necessary to clamber in to retrieve items from the sole and getting back out again will be a challenge. Over the 42's long production run (and testament to its longevity), Catalina has developed four interior options with two or three cabins. Owners can further specify a forward double on the centerline or an offset forward double that Catalina calls a Pullman berth. The review boat featured two aft cabins and a third forward cabin on the centerline. This, for my money, is a preferred option as it tends to give the yacht a greater sense of internal volume and greater cruising options with family and friends. 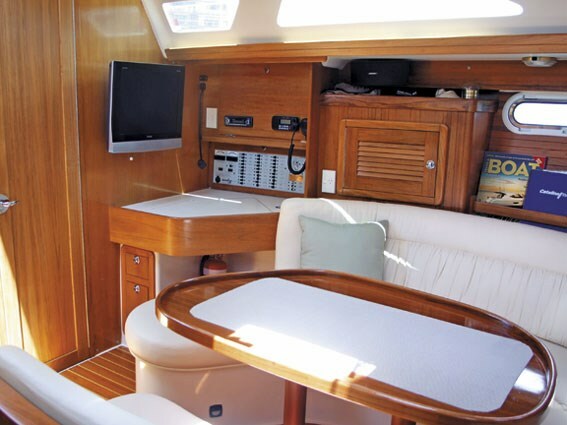 The interior layout features double quarter cabins immediately inside the companionway. These are large comfortable cabins and each is equipped with factory-made inner sprung mattresses and small, hanging locker and drawers for personal items. Light and ventilation is good with overhead hatches that open outwards into the cockpit. The day head is positioned on the starboard side immediately forward of the aft starboard cabin. Fully-moulded and lined, this provides a second shower, manual head with holding tank and a small vanity with stowage within. The galley runs along the remainder of the starboard side and is well equipped with twin stainless steel sinks, good under-bench cupboards and drawers, a top and side opening Adler Barbour 12V fridge and freezer and dedicated stowage for microwave oven and a gimbaled oven and two-burner hob. Counter space is generous but the fiddles are only just adequate, and cooking on the starboard tack could be challenging with little in the way of restraints to prevent the cook being tossed around the cabin. The saloon table is shaped around a semi-circular, ultra-leather settee with seating for eight. This is flanked with a second smaller settee on the centerline. This arrangement works well but it does tend to restrict access through the boat to a single lane. Generous use of teak and ash veneers lends a sense of the traditional and the teak and holly sole round out what is an attractive and airy interior with ample opening deck hatches. Lighting is particularly good with a mix of down and wall-mounted options. With the exception of the galley, the interior is well fitted with handholds to aid movement through the boat in a seaway. The chart table is located on the portside opposite the day head and this really is too small to be much use to the offshore navigator. The proprietary instrument panel above it, however, is well laid out and feature-packed with built-in shore power management functions. Moving forward, the centerline double stateroom is very much the master cabin with a large and comfortable double berth with drawers built into the base and supplemented with generous hanging locker and parcel shelves. With overhead hatches and opening ports, the cabin is airy and bright and well finished. The ensuite is large and fitted with a shower stall, vanity and mirror and manual head with holding tank in a clever design package that will satisfy most demands. Catalina pays more than lip service to marketing claims that its yachts are designed with easy owner-maintenance in mind. Access to the Yanmar 54 four-cylinder diesel engine is excellent and well thought out, with removable front and side engine room panels. The builder is equally strong on the provision of functional plumbing and electrics. Standard inclusions are pressurised hot and cold water system, hot water heater with engine heat exchanger and electric element, manual and electric bilge pumps. On-board systems are powered by two heavy duty 12V marine batteries, battery charger, shore power and circuit breakers for AC and DC electrics. We slipped out of Westhaven Marina into a light 10-knot breeze, ran up the fully battened main and pulled out the 135 per cent headsail and beat lazily up the harbour at around six knots. The elliptical and balanced rudder delivered plenty of feel through the rod linkage and not-too-large wheel. As we cleared the inner harbour the wind filled in and we came on to a close reach with 15 to 18 knots over the deck. The Catalina powered on at a shade under 7.5 knots and felt well balanced and well within full-sail capacity. The helm had plenty of weight but required only small adjustments to keep her tracking on course. The speeds we were not exceptional to windward but they were consistent and easily achieved. Tacking was not fast but she responded positively giving the crew ample time to haul in the masthead genoa. The yacht held her way well through the wind and was soon back into her stride. Overall, the Catalina's performance was undemanding and predictable. She tracks well, is easy on the helm, and speed is acceptable but not spectacular. With the exception of the main, the control lines and winches are well positioned for short-handed sailing. Under power, the Catalina 42 Mk II is entirely predictable in every respect, cruising comfortably at 6.5 to seven knots with a top speed of eight knots. The engine is smooth and quiet and the sail-drive leg vibration free. Manoeuvrability is excellent with a tight turning circle and ample control in reverse, making berthing stress-free. The Catalina 42 Mk II is a solid unpretentious cruising yacht with many sound qualities but few frills. The design has been well proven offshore. While she lacks dedicated sea berths and an adequate chart table, in most other respects she is a sound, solid and reliable offshore-capable yacht. And while the Catalina will not break records, she is easily handled and makes good progress for little effort, which is, perhaps, more important for the boat's target market. 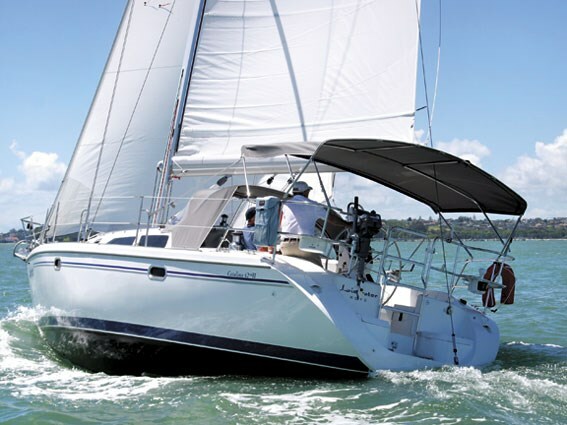 Yacht supplied by International Marine Brokers Ltd, Westhaven, Auckland.